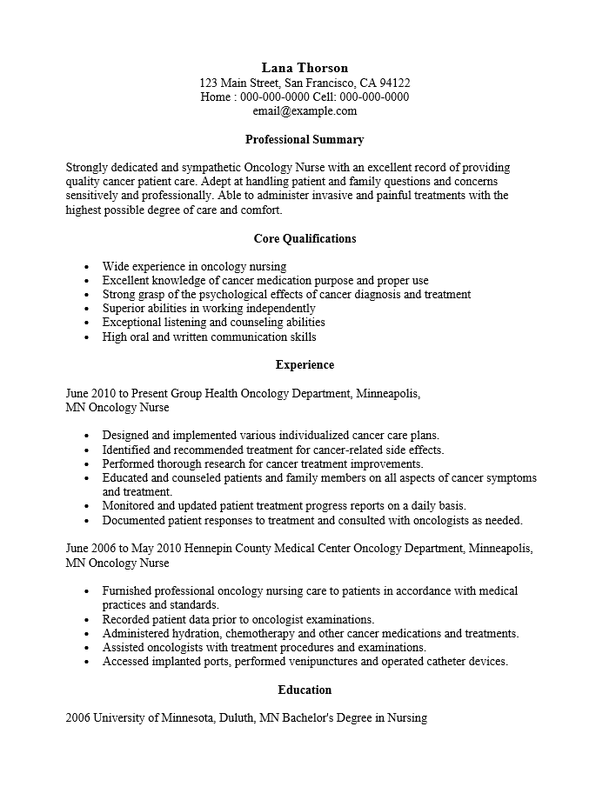 The Oncology Nurse Resume Template makes for a useful tool for nurses who wish to focus a career in helping cancer victims combat a deadly disease. As the cancer rates go up, more and more oncology nurses are needed for patient management. This can be a very demanding and very rewarding career for those who are truly dedicated to the nursing profession. 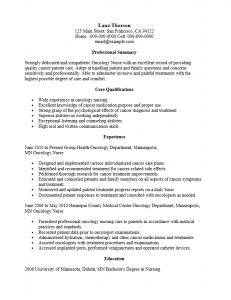 In order to compose an above par resume for this profession, a nurse must show that he or she are dedicated enough to operate under the stress involved with oncology. They must have impeccable credentials, a reasonable amount of applicable experience, and present a resume that looks (and is) flawless. Step 1. The first line of the resume should contain your first name. Enter your full name and add an effect to make it noticeable such as enlarging the font, bolding it, or underlining it. Step 2. The next several lines should be the most up to date and reliable contact information you have. This is how a recruiter interested in an interview will contact you. Input your mailing address, phone and cell number, and a professional email address. Step 3. The first actual section of the resume will be the “Professional Summary”. This should be one to three brief statements basically outlining your professional abilities in relation to the specific job title you are applying for. If possible include the name of the employer and department. Step 4. The second section of the resume will be the “Core Qualifications” section. This is a list of skills or experience that are applicable to the requirements of the field as well as any specific requirements listed in the ad you are answering. Make sure you sound confident in your abilities in this section. Step 5. The third section will be the “Professional Experience” section. Here, you will report your employment history. It is customary for this to be organized in descending chronological order. That is, the most recent place you worked should be the first entry while the next one should be a place you worked in before-hand and so on. Each entry should consist of a date range (date of hire to date of leaving), the name of where you worked along with the physical city and state location, and a list of the duties you were responsible for. Step 6. The final section will be the Education section. For each degree you earned list the year it was awarded, where you earned it, and the title of the degree you earned.